These are things I had to learn by myself in most cases. I have mentioned similar things in my previous posts too. – Most Icelandic business’ webpages are just a homepage. A physical shop in Iceland very likely has no website that you can buy things from, you have to actually go there in person. Usually they will also have a Facebook page, or may even have a Facebook if they don’t have a webpage, so if you’re looking for opening hours or locations you can check to see if they exist on Facebook too. However sometimes they don’t list their holiday hours. – There is a huge fee on “importing” packages from abroad. If you buy something from an online shop, at the minimum they’re probably going to charge you 500 crowns ($4 or so) even if what you bought was only 200 crowns. If the price of the item was small, like $10, I’m charged basically the same price in Icelandic crowns (essentially paying double for the item). I don’t know the rates, but along with tax I feel like sometimes they add on misc. other fees depending on what exactly I’m importing and where it’s coming from. – There are no ziplock bags or paper bags easily/cheaply available. There are only plastic bags. In the case of food, the food bags are open-ended and you have to clip or knot them closed (they don’t even have a fold-over part like sandwich bags have). On the other hand, the plastic grocery bags are much stronger than the same thing in America. You get charged for needing a bag at the grocery store, but not necessarily at independent shops. It’s not super common to bring your own cloth bag, at least not from what I’ve seen, but it’s not unheard of and they do sell them in many regular stores. – Stores close early and open late. This is a problem mostly for tourists – by seven at night, all the shops you want to go to might be closed. They might open again at nine, ten, even eleven in the morning. The ones that are open late are sometimes even twice as expensive as the ones that are closed. This goes double for government offices you may have to visit – for example, I had to see a lawyer at the Directorate of Immigration but they were only there for two hours each on Tuesdays and Thursdays, in the middle of lunchtime. The Swedish embassy similarly closed around four in the afternoon each day. In order of cheapest to most expensive based off what people have told me and my own experiences, here are most of the grocery/convenience stores in the major capital area: Bónus (extremely common), Krónan (more uncommon), Europris (uncommon, mostly dry goods, not only a grocery store), Hagkaup (uncommon but is in major areas, not only a grocery store, the only place I’ve found that ever sells cream soda), 11-11 (open 24hr, uncommon, the only place I’ve found that sells Scandinavian-style rice porridge rice), 10-11 (open 24hr, extremely common, sometimes sells fruit cups). Basically the rule is that if it’s a 24-hour store it’s going to be in the most expensive price range, and if it’s a normal store but more expensive then it’s going to have a wider selection of items. If it’s an independent store or a corner shop, even if it looks grungy and suspicious, it might have some items that you can’t find in any other store. Some Europeans seem to think Bónus is seedy and has too bad quality, but I think for everything except the fruit and non-Icelandic vegetables (and I’ve never seen imported fruit/vegetables in great quality even at the most expensive stores) it’s perfectly fine. Most food, even if you buy the cheapest brand, is higher quality than in America anyway because Europe has stricter food laws. If you can put up with it you’ll save a lot of money if you shop at Bónus instead of Hagkaup. Here’s an article in Icelandic on which stores are cheapest. – There is no food-taste standardization. For example. vanilla yogurt you buy might taste entirely sweet the first time, but the next batch has a hint of sourness and less vanilla. Sausage may differ in texture and spiciness, potato chips in the amount of seasoning and level of baked-ness too. If your sense of taste isn’t so acute then maybe you won’t notice this. – There are often no Icelandic subtitles on Icelandic DVDs. Icelandic subs tend to be only on foreign movies. Iceland seems to be good towards dyslexic people (and I’ve met more of those here than I ever did in America), not good at all to deaf people and average to blind people (in terms of tools and help obviously available – I’ve only looked into services for blind people because I’m nearly blind myself). On tv there are usually Icelandic subtitles for foreign programs, but on the DVD release of an English show it’s possible there’s none. Sometimes there isn’t actually an Icelandic DVD release but instead a “Nordic release”, so maybe you get Finnish, Norwegian, Icelandic, and English subtitles all on a Norwegian DVD cover – similarly you might buy a DVD that has only Icelandic subtitles and none for any other language. It’s possible to not find any Icelandic subtitles online even if it had subtitles when showing on tv. You should look carefully at DVDs because sometimes even an English DVD case that is unmarked on the front cover does have Icelandic in the language options on the backside. – You have to register a change of address at both the “National Registry” and the post office (you can do it online, for the post office) for it to actually take effect. You also have to pay for mail forwarding, but you can do this online at the same time as you change it. – Postage stamps are not self-adhesive. At the post office tends to be a little circular, orange-yellow sponge with glue inside, and you press the stamp onto that for it to get sticky. At least some of them are also lickable. 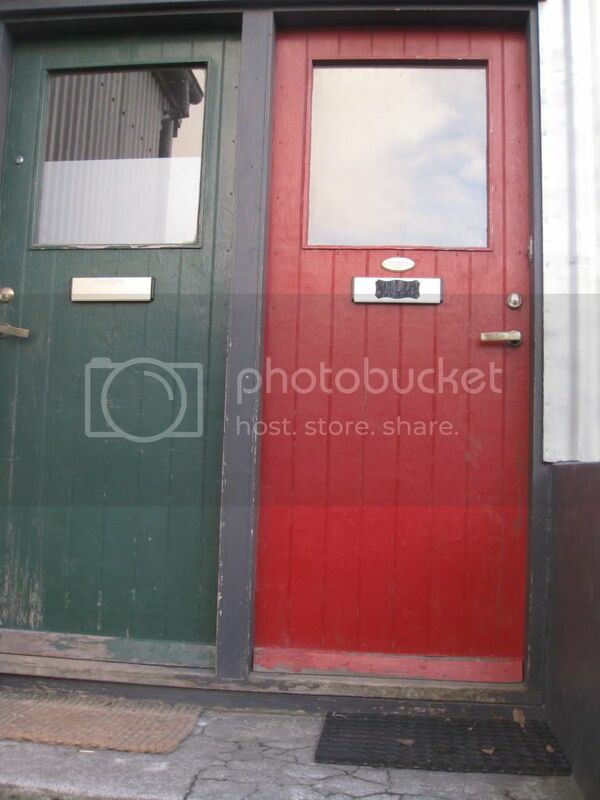 The little oval above the mail slot on the door to the right is a nameplate. – As of some time ago, you need to write the addressee’s name that matches the name on their front door on all mail delivered to Iceland or the post office might not deliver it, but I’m not sure if it’s really in practice. If you use nicknames with mail, you should add them to the note on your door as well. I just tape a piece of paper with our full names and nicknames on it to the front door, but you can buy actual metal nameplates to put on your house too. Packages will never be left on your doorstep – either you answer the deliveryman’s knock, they’re small enough to fit through your door-slot (there are almost no mailboxes in Reykjavík, but slots in front doors instead) or they are left at the post office for you to pick up. – Official places tend not to have signs in English. This means hospitals, banks, the national registry, even the foreign immigration office. They might speak English just fine (or might not…) but there will most likely be no English on their navigational signs and sometimes they don’t have English versions of their forms. Likewise, if you get mail from the tax office, immigration office, bank, etc. it will always be in Icelandic and they cannot send you things in English. Luckily I’ve never met an Icelander who wasn’t willing to translate the gist of these papers for anyone, even if they were a complete stranger. The only problem this really creates is when someone gives you directions then forgets that none of the signs are in English, so “go down the steps and to the left then you’ll see it” isn’t clear at all if you can’t read any of the signs. – Bus transfers only last an hour and you get them when you get on the bus and pay, not when you get off. So it’s possible that you ride one bus and then your transfer is nearly over. Reasons like this is why it’s best to buy a bus card if you plan to do any sort of regular bus travel. That being said, especially if you live in Reykjavík a lot of places are very easily walkable. I wish I had realized this sooner because I spent a lot of bus money when I first moved to Iceland because I had to go to various places like Kringlan (a mall) a lot, when I didn’t realize it was so close. From the pond I can get to Kringlan, to the other edge of town where they have much larger grocery stores, to the National Registry, to the Foreign Immigration Office (which is also the marriage office), or to The Pearl (tourist spot) in about thirty minutes. The Pearl might take ten minutes more depending on how easily you climb hills. You can also walk from the pond to Viðey’s ferry (a little island that has a museum and sometimes holds festivals, it also used to have a printing company on it but I’m not sure if that still exists) in about an hour. The pond to the University of Iceland is only about a ten-minute walk. – If you want to speak Icelandic with Icelanders one option that’s best (because most people do this anyway) is to go to parties, because people are often too drunk to care if you have terrible Icelandic. The other options are “find an Icelandic spouse”, find Icelanders who lived abroad or want to live abroad and therefore know what it’s like/love foreigners and don’t mind talking all day in Icelandic to them, and find people who refuse to speak in English. This last type is the safest bet, they’ll talk to you in Icelandic even if you literally know only two words. You may sometimes find it difficult to get other people to speak Icelandic to you for a long length of time, especially if you’re not perfect in Icelandic, but other foreigners are very likely to have no qualms about speaking in Icelandic with you. The post office, clinic and hospital (only for small things such as shots and blood tests), and the pharmacy are all places where it’s likely they’ll speak in Icelandic to you even if you answer in English, as long as it’s clear you can understand them. The bank, national registry, libraries, and other such places are more likely to switch to English, write something down or glance at the computer, then forget they’ve been talking in English and switch back to Icelandic. The doctor, cashiers, and regular people on the street (if you’re doing more than just exchanging a few sentences) are more likely to speak just in English to you. Many places that would normally start out talking in Icelandic (such as a convenience store) instead start out in English, during the tourist season. – Iceland has a heavy partying culture. This means that if you live in the middle of Reykjavík like me, there will be at least two parties in your apartment building or on your street every single weekend, on Fridays and Saturdays and sometimes even Sundays or weekdays. There’s no such thing as being too loud and I’m not sure the police would even come if you complained about noise. It gets especially busy during the summertime. People also like to scream as if they’re being attacked when they’re just having fun (whether or not they’ve been drinking), and while that’s pretty alarming at first you eventually get used to it. You may make friends or have flatmates who do actually go out every single weekend, despite how expensive it is. Many people will only see you at parties or when out clubbing and never have time to see or talk to you during the normal week, whether they’re friends or co-workers. – Many Icelanders tend to check their Facebook more than their Email, Skype, et cetera. Even small groups in Iceland will have a Facebook page, even if it’s a one-time event. If you want to get in touch with your Icelandic friends you’re pretty much forced to use Facebook because even if you talk to them often, you’ll probably miss out on a lot of these little events. – If you bring your own food or drink into a café they might charge you for it as if you bought it at their place, even if you bought some of their actual food at the same time. – You can take a driver’s license test (specifically, my knowledge is about a motorcycle test) with a translator if you don’t know Icelandic well enough, but in the case of one unfortunate lady the translator translated the terms wrong and so she failed because of the translator’s mistake. – Icelanders aren’t shy about exchanging contact information, either in person or online, even if you’ve only met the once and for a short while. I’ve had even doctors give me their personal mobile number when I was only a patient. They also don’t seem to be shy about meeting up with strangers even without ever having met them before, whether it’s to chat or sell things. Maybe there’s just a big culture difference with all of this or maybe I keep meeting only the strange Icelanders. – It is very easy to not learn Icelandic in Iceland. Everyone knows at least basic English except for some immigrants and children, and a lot of things like signs and product labels are also in English or another non-Icelandic language. Many Icelanders will talk to you in English automatically (especially during tourist season) if you look non-Icelandic or if they see you have a non-Icelandic name. Not only is it sometimes quite hard to get Icelanders to talk to you in it, but if you have a job it’s probably impossible to also take serious classes at the same time due to schedule conflicts or the workload. I’ve heard that most of the Icelandic classes here are actually quite bad and most people who want to learn tend to have to take many different ones, including taking the same ones twice. My flatmate for example has taken five different Icelandic courses and has taken two of them twice, living here for about six years and working at the same time. For someone living with an Icelandic family or spouse, or who has many Icelandic friends that they can practice with, of course it’s a lot easier to pick up Icelandic. It’s also easier if you get a job and have already learned the basics of the language, as well as are in a position where you can force people to speak in only Icelandic to you. Most people’s situations aren’t like that (especially if you’re like most people and don’t even live in Iceland). I have a few friends where they do have full-time jobs that don’t allow them to take Icelandic courses, their Icelandic coworkers won’t speak in Icelandic to them, and then they go home and have no Icelanders in the house to practice with as well as not having Icelandic friends who have the time to help them with anything. At that point it’s almost as hard as not even living in Iceland! – There are almost no vending machines anywhere. 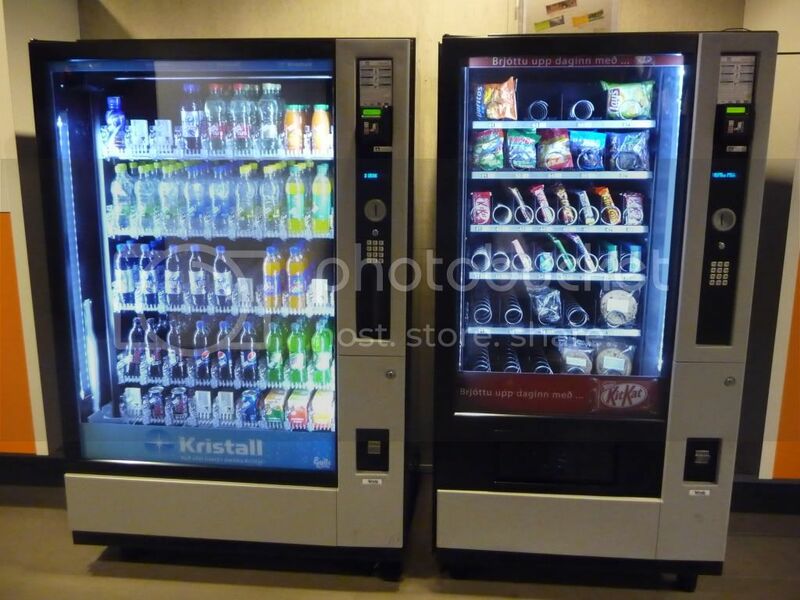 The rate of vending machines is like the rate of pay-phones in America (there’s one in the hospital and the photo here is of two in the basement floor of one of the University of Iceland buildings). Same with drinking fountains, although there is at least one downtown and there are some in the University of Iceland’s newer buildings. – Iceland really has holiday items. Some of them are the same things in different packaging, but some products have special flavours, spices, or sizes that are only available at certain times. The only problem with this is that a lot of them are unmarked (either with nothing, or for example “spices” instead of something specific like “pepper and bell pepper”) and so you don’t always know if you’re getting something special or something normal. Occasionally items are also just not available at other times of the year, like some baking items. I try to write about two-thirds of the blog topics on cultural aspects and one-third on the language, because there's much more out there already on the language compared to daily life information. I try to stay away from touristy things because there's more of that out there than anything else on Iceland, and I feel like talking about that stuff gives you the wrong impression of Iceland.